Twitter has today become an integral part of an overall film experience for fans with the best of film stars, movies and conversations on the platform. Users today have access to the biggest of stars and films through Twitter - with celebrities using the platform to connect and innovatively engage with audiences across the globe. 2017 proved to be yet another interesting year for the film fraternity. With the best of conversations and exclusive content in the form of behind-the-scenes updates, live Q & A chats, live broadcasts to thrilling personal conversations and more, Twitter continued to be a window into the film world in India. 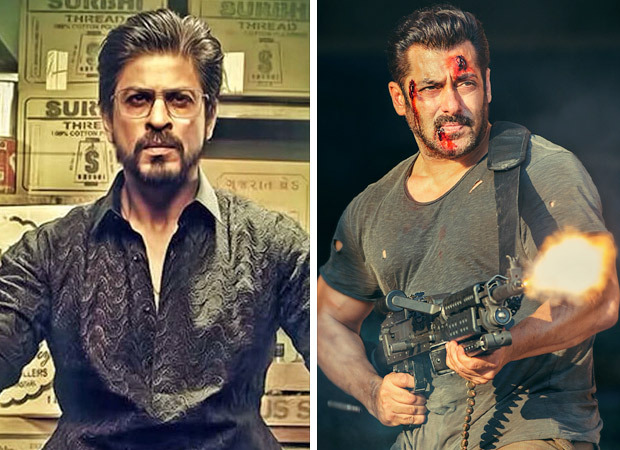 Shah Rukh Khan's Raees became the most talked about Bollywood film of 2017 on Twitter which was followed by Salman Khan's Tiger Zinda Hai grabbing the second place, according to Twitter India's annual ranking list and based on hashtag volume. Salman Khan's Tubelight may not have done well at the box office but it sure did well on Twitter with the third position on the list. Sanjay Leela Bhansali's controversial film Padmavati starring Deepika Padukone, Shahid Kapoor, and Ranveer Singh came in on more fourth position followed by Hrithik Roshan's Kaabil on the fifth position. 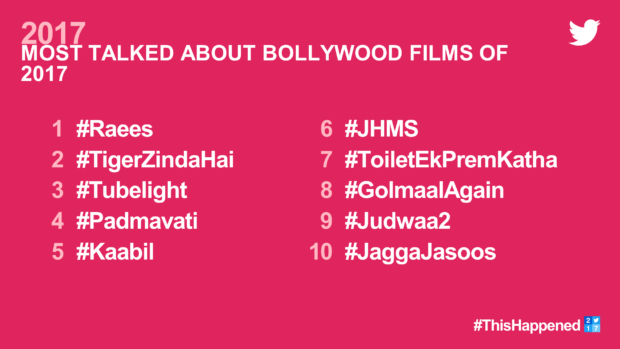 SRK’s Jab Harry Met Sejal secured sixth position followed by Akshay Kumar’s Toilet Ek Prem Katha, Ajay Devgn’s Golmaal Again, Varun Dhawan’s Judwaa 2 and Ranbir Kapoor’s Jagga Jasoos. Shah Rukh Khan’s Raees Trailer Will Be Out In December!